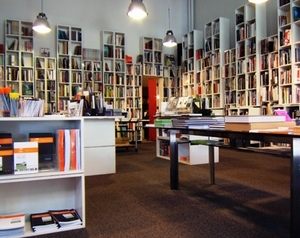 Peter Miller is a design bookshop on Second Avenue in Seattle, Washington, carrying mostly new titles in design, architecture, graphics, landscape, urban design, residential and interiors. At the front of the shop are design products, including fine pens and pencils for both writing and drafting, glassware, table settings, Aalto stools, Stendig lamps, and two bright red Aalto benches. One wall displays the store's best selection of notebooks, pads, drawing paper and desk accessory. And another shows Peter Miller's choice of bags and briefcases and portfolios from Nava Milano. Some of the store's larger books and the rare or out-of-print titles are at the front desk. Music is played via a Tivoli Networks internet radio, typically SR Klassiskt from Stockholm or Linas Jazz from Paris or Radio 6 Blues from Hilversum.